Delgado, J.R. (1959) Electronic command of movement and behavior. Transactions of the New York Academy of Sciences, 21, 689–699. Estabrooks, G.H. (1971) Hypnosis comes of age. Science Digest, April, 44–50. Faretra, G. & Bender, L. (1964) Autonomic nervous system responses in hospitalised children treated with LSD and UML. Recent Advances in Biological Psychiatry, 7, 1–8. Gillmor, D. (1987) I Swear By Apollo. Dr. Ewen Cameron and the CIA-Brainwashing Experiments. Montreal: Eden Press. Merskey, H. (1995) Multiple personality disorder and false memory syndrome. 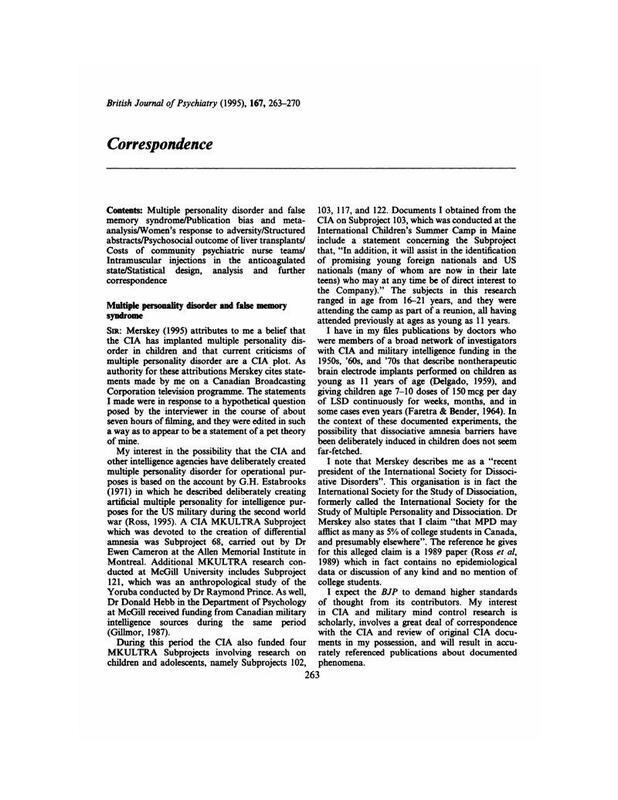 British Journal of Psychiatry, 166, 281–283. Ross, C.A. (1995) The validity and reliability of dissociative identity disorder. In Dissociative Identity Disorder. Theoretical and Treatment Controversies (eds Cohen, L., Berzoff, J. & Elin, M.), pp. 65–84. Northvale, New Jersey: Jason Aronson. Ross, C.A., Norton, G.R. & Fraser, G.A. (1989) Evidence against the iatrogenesis of multiple personality disorder. Dissociation, 2, 61–65.